Sunspot 1302 has already produced two X-flares (X1.4 on Sept. 22nd and X1.9 on Sept. 24th). Each of the dark cores in this image from SDO is larger than Earth, and the entire active region stretches more than 100,000 km from end to end. 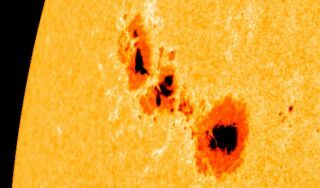 The sunspot's magnetic field is currently crackling with sub-X-class flares that could grow into larger eruptions as the sunspot continues to turn toward Earth. Particles that were blasted from the sun by a huge eruption over the weekend have reached Earth, causing geomagnetic storms on our planet, which will likely trigger a stunning northern lights show for some lucky skywatchers. The particles reached at Earth at 8:37 a.m. EDT (1237 GMT) today (Sept. 26), kicking off moderate geomagnetic storms at lower latitudes and more serious storms closer to the Earth's poles, according to the U.S. National Oceanic and Atmospheric Administration (NOAA). These storms can disrupt GPS signals, radio communications and power grids, but no such effects have yet been reported, NOAA officials said. "Aurora watchers in Asia and Europe are most favorably positioned for this event, though it may persist long enough for viewers in North America," officials with NOAA's Space Weather Prediction Center (SWPC) wrote in an update today. The sun unleashed a powerful solar flare and an event known as a coronal mas ejection (CME) on Saturday (Sept. 24). CMEs are massive clouds of solar plasma that can streak through space at 3 million miles per hour (5 million kilometers per hour) or more. Luckily, this CME delivered a glancing blow. If it had hit Earth directly, the geomagnetic storms — and, possibly, the damage — could have been more serious. But we're not out of the woods yet, SWPC officials said. "Region 1302 remains capable of producing more activity and will be in a favorable position for that activity to have impacts on Earth for the next 3-5 days," SWPC officials said. For now, however, the biggest effect of the geomagnetic storms may be the auroras, so skywatchers in favorable locations should look up when they get the chance. People in the mid- to high-latitudes should be alert for auroras after nightfall. The best hours to spot the northern and southern lights tend to be around local midnight, according to the website Spaceweather.com. Sunspot 1302 has been particularly active lately, spouting off multiple X-class fares — the most poweful type — over the last few days. And that restlessness is part of a larger pattern, experts say. Sunspot 1302 poses a continued threat for X-class solar flares. Solar activity has been ramping up over the last few months as the sun has roused itself from an extended quiescent phase in its 11-year cycle of activity. Just last month, for example, the sun let loose with an X6.9 solar flare, which was the most powerful solar storm since December 2006, NASA scientists said. Editor's Note: If you snap a photo of the supercharged aurora and would like to share it with SPACE.com for a story or gallery, please send to managing editor Tariq Malik at tmalik@space.com.